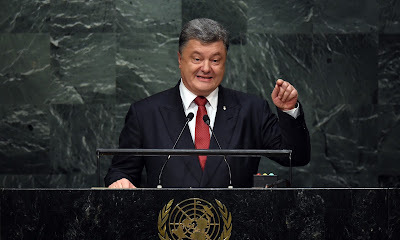 UNITED NATIONS, USA -- Petro Poroshenko says Moscow is waging a ‘hybrid war’ against his country in general assembly address that prompts walkout by Russian delegation. 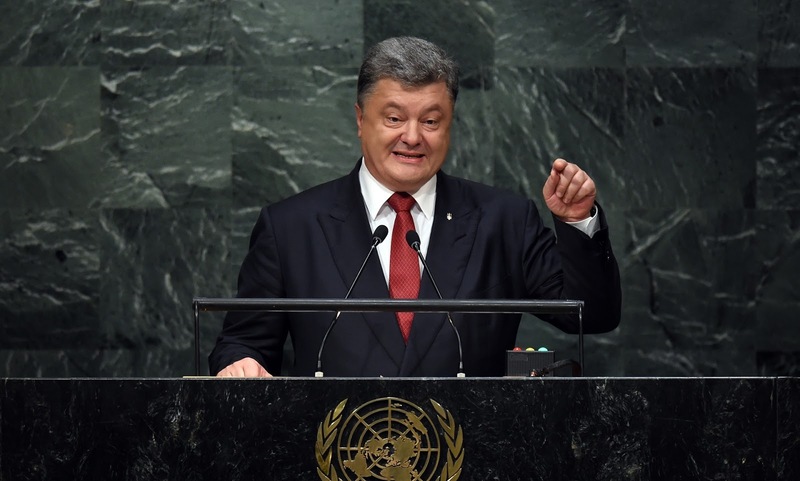 Petro Poroshenko, the president of Ukraine, accused Russia of a ‘brutal violation’ of the UN charter in a speech laced with sarcasm and contempt. Ukraine’s president, Petro Poroshenko, has accused Russia of using its veto on the United Nations security council as a “licence to kill” and continue Moscow’s “hybrid war” against his country. The Russian delegation walked out of the general assembly hall as Poroshenko accused Moscow of a “brutal violation” of the UN charter with what he said was its invasion of Ukrainian territory. In a speech laced with sarcasm and contempt, he accused Moscow of a campaign of “fake news, blatant lies” in an attempt to portray separatist movements in Ukraine as an internal rebellion and hide Russian’s involvement. “I would like to stress it is neither a civil war nor an internal conflict,” he said. He also condemned Russia’s veto of an international tribunal to hold to account those who shot down Malaysian airlines flight MH17 over rebel-held territory in Ukraine, saying that “everyone in this hall understands Russia’s real motive”. “The use of its veto right as a licence to kill is absolutely unacceptable,” said Poroshenko. Poroshenko accused Russia of a “military reckless game” by invading Ukraine’s Donbass region. “Here we are forced to fight proper fully armed troops of the Russian federation,” he said. He accused Moscow of trying to force Ukraine to turn its back on the west and move into Russia’s orbit. It is, Poroshenko said, part of a strategy by Russia to “deliberately create around itself a belt of instability” with violent upheaval in nations on its borders. “What and who is next?” he asked. The Ukrainian leader said all of this is driven by Russia’s longing to revive its former imperial glory, calling it “a desperate attempt to obtain self-affirmation at others’ expense”. Poreshenko appealed for the international community to maintain pressure, including sanctions, on Russia even as western attention has flagged since a rickety and frequently breached ceasefire was agreed in February and with other crises, including Greece’s economy and the Syrian migrants, veering on to the scene. How can you urge an anti-terrorist coalition if you inspire terrorism right inside your door?” he said. “How can you speak of freedom of nations if you punish your neighbour for this choice?" Poroshenko expressed incredulity that the aggression against Ukraine is being perpetrated by a country which is supposed to be a guarantor of international peace and security as a permanent member of the UN security council. The Ukrainian leader said that Russia abused its position by using its veto to block a resolution on what he described as the “fake referendum” of residents of Crimea which Moscow used to justify the forceful annexation of the territory from Ukraine.